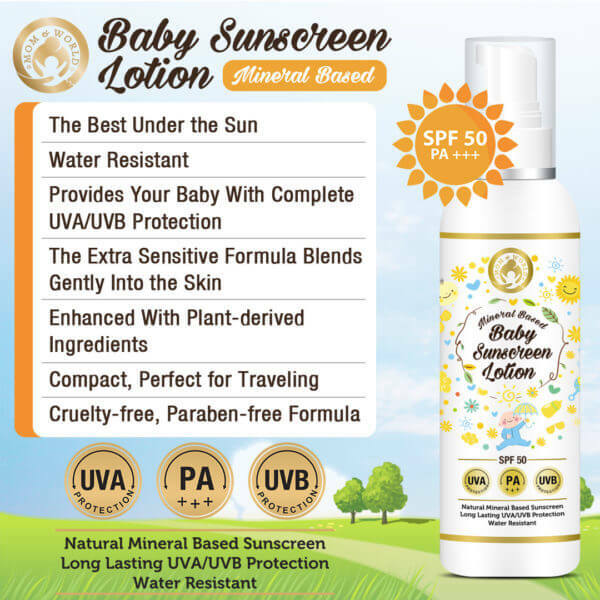 Mom and World Mineral Based Baby Sunscreen Lotion SPF 50 is specifically designed for the babies keeping in mind their delicate skin texture. It has protection from the sun. This sunscreen lotion is skin-friendly as it does not cause any irritation and it is non-greasy as well. 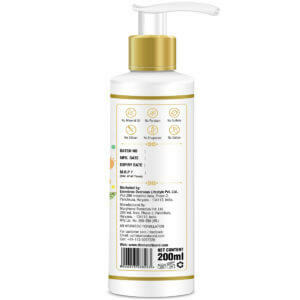 Mom And World Baby Sunscreen Lotion SPF 50 is ideal for sensitive baby skin as it is non-allergenic and can be applied all over the exposed skin. This product is free from harmful chemicals, sulfates, parabens and mineral oils. 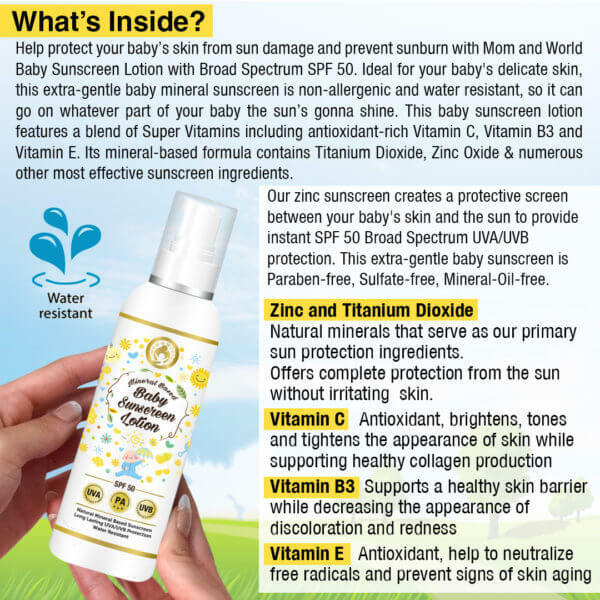 Mom And World Baby Sunscreen Spf 50 is safest because of the presence of Zinc Oxide and Titanium Dioxides – and this is considered to be the main ingredients. Though, the product is for the baby skin – but can be also used by adults as well. Why Do You Have The Sunscreen Requirement? Harsh summer sun makes the skin feel irritated, red, itchy and rash prone. If, these are the effects of the sun on our skin – then what will the sun’s evil eye do on the delicate baby skin? The soft and tender baby skins are much more prone to damage due to the harsh environmental condition. Hence one must ensure that the baby is well protected from the scorching and sweltering summer sun and its harmful and damaging UVA or UVB rays. However, think again before using the same sunscreen or sunblock products that you use. The baby skin is delicate and gentle, hence, has a very different requirement for its care and protection. 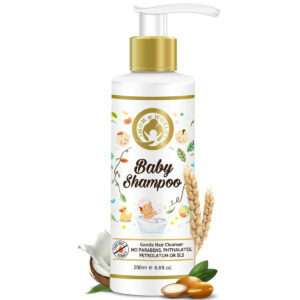 Keeping its unique needs in mind, the baby care products are formulated to cater care and protection, to the baby skin. The baby care products give enough protection from all sorts of skin damage. It is quite safe to use sunscreen products on babies after they reach the age of 6 months and beyond. It is often recommended to avoid exposing the babies to the scorching sun during peak hours. Experts suggest that it is best to cover the baby with proper clothing when out in sun. However, when they reach 6 months old – it is fine if they use a sunscreen meant for them. One must take utmost care while selecting the sunscreen lotion or products for the baby skin. The sunscreen lotion is best when it contains sun protection factor – which is commonly referred to as SPF. Presence of SPF indicates the ability of the protection it provides to the skin against the sun UVA/UVB rays. The product having both, ‘UVA/UVB protection ability’ – is usually mentioned in the pack. Sunscreen lotions that are mineral based are skin friendly not just for your baby – but can be a good option for your skin too. The product gives an overall protection – it provides Broad Spectrum SPF 50 protection from UVA/UVB sun rays. The product is compact, water resistant and suitable while traveling. This mineral-based product is made from quick absorbing Zinc Oxide along with Titanium Dioxide. It proves to be an excellent sun protection for your baby. 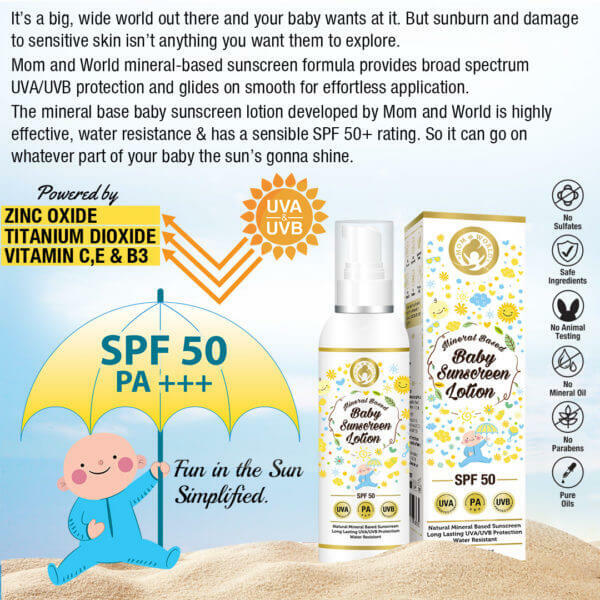 It protects the baby skin from the harmful effects of UV and UB rays. It is a mineral enriched formula product – having Quick absorbing Zinc oxide along with Titanium Dioxide. The product is designed to give complete sun protection – as it has Broad Spectrum SPF 50, giving the UVA/UVB protection shield. Titanium Dioxide is known for its ability to provide complete protection from the harmful rays of the sun. The sunscreen lotion that is natural mineral based – provides long-term protection from the UVA/UVB sun protection. This sunscreen lotion is skin friendly – as it is not greasy, non-irritant and non-allergic to the skin. 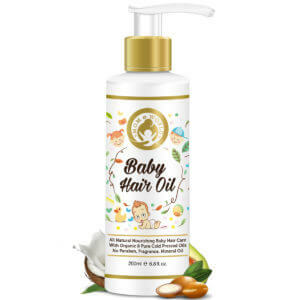 The product is devoid of harmful chemicals – it is free from parabens, mineral oils, and sulfates – hence it is easily beneficial for the tender baby skin. Water Proof Upto 2 Hours. What Is The Benefit Of Zinc Oxide And Titanium Dioxide In A Sunscreen Lotion? What Is The Uniqueness Of Broad-Spectrum Protection In Sun Protection Products? Sunrays reach us in three forms – UVA, UVB, and UVC. All these three are ultraviolet rays. UVA and UVC are prove harmful to the skin. UVA and UVB are the reason for sunburn and ageing. The products having broad-spectrum denotes that it gives full sun protection coverage from UVA/UVB. It provides protection from – sunburns, premature wrinkling, and age spots, and also protects from skin cancer. To get the best result – it is recommended to apply the lotion on the exposed areas – where the skin gets sun-kissed. The best protection can be yielded when applied 15 minutes prior to the sun exposure. The lotion is smooth on application – and therefore, applying it thinly on the skin may not give the expected result. Thin layers on the skin might reduce the effectiveness of the protection. I use this sunscreen lotion whenever I take my baby outdoors. It spreads easily on the skin and keeps the skin hydrated and protected.